New infrastructure. A real improvement or making stop-start cycling even slower ? This piece was originally titled "New British Infrastructure..." and the bad examples shown below are all from the UK. However, the exact same problems are seen around the world. Cyclists often win "commuter races" because of their ability to get through traffic jams which hold up both motorists and public transport. Many existing cyclists enjoy the fact that they can make fast journeys have have predictable journey times. These give cyclists major advantages over using other modes of transport. If cycling is to be spread wider through the population then other people need to see the same advantages. There is no point in giving people a choice between being able to ride slowly on inadequate cycling facilities or having to "take the lane" on the roads. Neither of these two options is good enough. Cycling must be both safe and convenient and we should not be asked to choose between one or the other of those two desirable characteristics. Unfortunately, many people who plan for cycling in the UK don't seem to understand the need for efficiency when cycling. 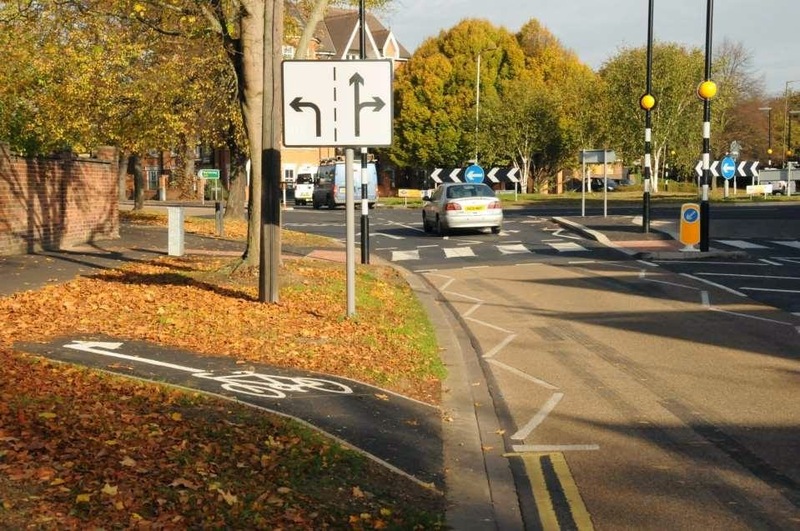 Rather than creating cycling facilities which make cycling both convenient and safe, there is a consistent problem across the UK that facilities are designed to such a low standard that they are neither convenient nor safe. where they will have to cross a road. I wrote two weeks ago about Southend's lacklustre attempts at encouraging cycling. Quite apart from having used almost all their funds for two expensive schemes which are designed for motor vehicles and ignore the needs of cyclists, the blind corners, narrow shared-use cycle-paths and road crossings of astonishing slowness seen elsewhere demonstrate how the town is not working seriously to provide efficient go-everywhere routes for cyclists. In response to my blog post there were several suggestions that I should especially have looked at the Prittle Brook Greenway because this is a highlight. I decided in any case to look up what I could find about the Prittle Brook Greenway. The first item to come up was Southend's own information, a small part of which is reproduced here. The second item was a local campaigner's description of it as "a 2 mile long, 2 metre wide shared use path that involved 19 road crossings". Follow the link to see a surface which washes away in the rain on a path with blind corners and low social safety. A local civil engineer pointed out the lack of lighting and a previous problem with dog excrement as well as a later post discussing problems with crossings and with vandalism. built to a proper standard ? 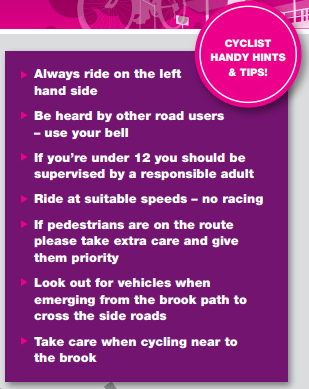 The campaigner's description goes some way to explain why Southend council's official recommendations for this route suggest that under 12s should be supervised, that there should be "no racing" and that cyclists must "Look out for vehicles" and "take care" around pedestrians. I've seen paths like this all over the UK and I'm not sure I missed much by not seeing this particular example. It can be OK for an outing with children on a sunny day but this is not the sort of infrastructure which leads to mass cycling. The truth is that I missed the Prittle Brook Greenway before because it didn't go anywhere that I was going. The most important result from Dutch research in the 1970s was that a dense grid of very high quality routes is required. i.e. Good infrastructure shouldn't be something that you have to look for, it needs to be everywhere. Even if it is of very high quality, very direct and socially safe (unfortunately, Prittle Brook doesn't tick those boxes), a single path cannot achieve much on its own because it simply cannot serve every location. Southend has actually spent a lot of money. They could have transformed the town but they've instead directed it at the wrong projects. Neither a high enough quality level of facility nor the required dense grid have been provided for cycling and that's why cycling remains a niche mode of transport in the town. Firstly, cyclists in London are a rare breed. Just as everywhere else where cycling is for a small minority, those who do it mostly fit into a particular demographic. School trips by bike are difficult to imagine taking place. You don't see a lot of pensioners or disabled people cycling either. Cyclists in London must be alert and constantly looking out for where the next threat will come from. Cycling isn't a way of getting about which anyone can choose as most people simply won't consider it in those conditions. Those who cycle in London have reasons to do so. Secondly, there was an overwhelming sense of frustration and slowness. On Dutch cycle-paths, I expect to be able to get up to speed and to be able to keep cycling with the minimum of interruptions until I reach my destination. I rarely have to stop at traffic lights and am rarely inconvenienced by motor traffic. That's not at all how it is in London. Cycling in London feels quite competitive. People jostle for position in ASLs, there's a lot of sprinting from one traffic light junction to another, but overall progress is slow. Average speeds over a complete journey, even over short distances, are low. Compared with what I'm used to, I found cycling in London to be irritatingly SLOW and I was amazed by how long it took to cover even a short distance. London has not learnt the importance of providing infrastructure of a high enough standard. The "superhighways" are well known to be not super at all but rather than copying from best practice and providing adequate funds to do a good job, London is still going its own way, thinking up new and absurd ideas, producing lots of press releases and trying to build the actual infrastructure on the cheap. For instance, less than a year has gone by since London proposed an absurd multi-stage right turn which demonstrated a complete lack of understanding what is required to make cycling both safe and efficient, and they've continued right up to the present time with designing and building infrastructure which is way short of the standard which is required for true mass cycling. safe Dutch roundabout in design. 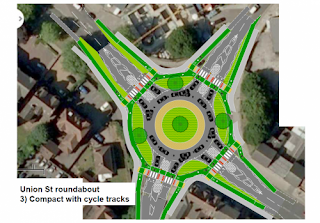 The continuing "#Turbogate" scandal in Bedford, where they claim Dutch inspiration for a roundabout design which is fundamentally different from real safe Dutch roundabouts, dates back a long way. I was first involved in trying to advise a Bedford planner about how Dutch roundabouts really accommodate cyclists way back in 2011. Sadly, rather than accept the widely published and very reasonable criticism of their flawed design, Bedford and their backers (including Sustrans) have not accepted the widely published criticism but have continued to push a design which divides cyclists into two groups: those who will "take the lane" on the busy roundabout and those who will be too timid to do this and will instead use pedestrian crossings to pass the roundabout. Dutch cyclists never have to choose between "safe" or "fast". With one minor change which might actually make the roundabout more dangerous, building of this flawed and dangerous design started this week. Update 2015: A downloadable report is now available about this roundabout. One image, along with its caption, is shown on the right. Northern Ireland has its own problems. The nigreenways blog pointed out this week that the Department of Environment, "where local road safety promotion sits in isolation from the road builders", has produced a jaw-droppingly bad road safety video which gives ludicrous recommendations for how to stay out of trouble, such as that people should "avoid the busiest times" (i.e. don't use cycling as a practical means of transport for such things as going to work or to school) and makes one excuse after another for the terrible quality of the infrastructure which they have built. It's the same problem as seen elsewhere in the UK. Northern Ireland's cycling infrastructure is not fit for the purpose of making cycling attractive and convenient for the entire population. That's why Northern Ireland, like the rest of the UK, has a very low cycling modal share. I've written quite often about Cambridge because we used to live and campaign there, watching local infrastructure change at a glacial pace. Cycling in Cambridge has perhaps the greatest help from demographics and local laws of any city in the world, yet it doesn't not have the highest cycling modal share of any city in the world. I suspect that if the city had infrastructure like Dutch cities then Cambridge could quite easily have a higher cycling modal share even than Groningen. Unfortunately, the current level of political commitment and investment prevents cycling in Cambridge from growing to its full potential. While the city has the highest cycling modal share in the English speaking world, it doesn't make a useful model for other places because the causes of the relatively high cycling rate of Cambridge are not things that can be duplicated. Much of the cycling in Cambridge takes place despite the infrastructure rather than because of it. Since we left the city there have been changes, but they've not made a very big difference. There is still no sign of the comprehensive grid of high quality infrastructure required to get everyone cycling. For instance, it took 12 years of discussion and a lot of campaigning before the busy Gilbert Road was changed, but the outcome even on this one km length of road wasn't nearly what it could have been. be a feature of a real cycling facility. More recently there have been proposals to change Hills Road and Huntingdon Road. These proposals have been a long time coming and were eagerly awaited. 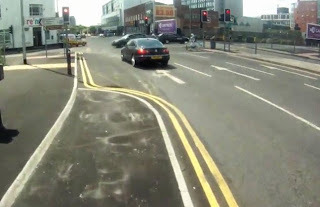 I used Huntingdon Road regularly when we lived there so I looked at this part in detail and explained in a long comment on the Cycling Embassy of Great Britain website the many problems with the design for this short length of road. Please read that link to find out more. To summarise, they're planning to change just one side of approximately one mile of road (you're on your own on the return journey). There are many problems packed into this distance, which will make for a far too varied and "exciting" mile of cycling. Consistency may be boring but everyone knowing what comes next is a safety feature. Just one of the issues with the plan is enough to illustrate the gulf which exists between what Cambridge really needs to enable cycling for everyone and what the plans which currently exist in the city promise: "the plan is for this already narrow cycle facility to be even narrower and even more dangerous at bus-stops. Here it will shrink to a totally inadequate 1.5 m, and this is to be done deliberately in order to slow cyclists down. 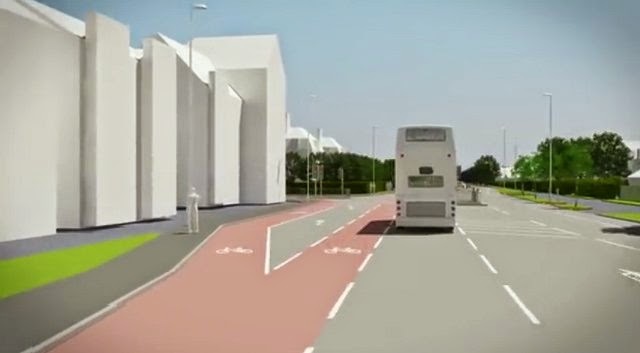 If this were a cycling facility designed to actually facilitate cycling then it would try to make cycling faster and more convenient, not to make cycling slower." up and "keep your wits about you". not seen in Assen since the 1970s. That's just one of the problems. There are other faults such as being too narrow for safe passing and lethal junction designs and that it gives up entirely before the biggest junction. But in my view the most damning thing is that even this much awaited very short length of facility is not actually to be optimized for cycling at all but will instead include features deliberately designed to make bikes slower and therefore also less attractive. Rather than seeing the existing level of cycling in Cambridge as good for the city, good for the people of the city and as something to encourage more of, planners in Cambridge view cyclists as if they are a problem which it is somehow their job to solve. This is precisely the attitude which has prevented Cambridge from achieving its potential as a cycling city. roundabout junctions in Leeds now ? The Leeds-Bradford cycling "superhighway" proposal was announced with the customary blitz of publicity surrounding all new cycling schemes in the UK and achieved some considerable press already, but like most new infrastructure in the UK it's designed in such a way that it will be far from convenient to use. "Cycling in a segregated cycle lane [...] might be slower, for instance when they are congested, or when we are required to make two-stage right turns, waiting for signal phases." i.e. 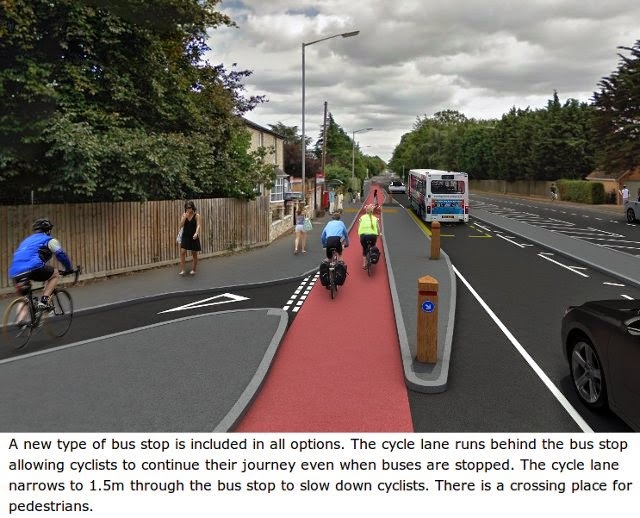 they're planning to make the cycle-paths too narrow so that it's difficult to pass safely and to use junction designs which are already known to be both inefficient and unsafe for cyclists. "Many current cyclists are used to speeds of 20 miles an hour or more (going downhill) and a lot of current cyclists are, for want of a better phrase, speed freaks. It will not be easy to maintain this along all of the segregated routes." i.e. existing cyclists for whom journey time is important (that's everyone who cycles if they're late for an appointment, for work or for school) as "speed freaks". Rather than being seen as a group of users who need to be supported and assisted to make their journeys in safety, they're seen as a problem. Rather than planning for the entire population, these planners want to design infrastructure for a mythical person who is never late, never in a hurry and has all day to meander around and to work out how to use their complicated design. They are asking people to choose between "safe" on their cycle-paths or "fast" on the road. No-one should be asked to choose between those two things. There's nothing "super" about these "superhighways". The criticisms which have come up are not of segregated cycling infrastructure in and of itself (there are no speed limits on Dutch cycle-paths) but of the poor designs which are being pursued for this project. The City Connect project in Leeds and Bradford has designed down to extremely low standards (to read more, see The Alternative Department of Transport's extensive criticisms of the plans). By building cycle-paths too narrow for safe use at speed, and by implementing copies of junction designs known to be both dangerous and inconvenient rather than copies of the safest and most convenient designs of roundabouts and traffic light junctions, they are guaranteeing that the most efficient place for a cyclist to be along this route will remain the road and not the cycle-path. But aren't these places "making a start" ? they do not lead to many destinations. 30 years ago but it was not. When examples like these are criticised, it's quite common that someone will suggest that "it's a start". People have a hopeful idea that building substandard infrastructure now will somehow lead to better infrastructure later. They'll say that "everything has to start from somewhere", "something is better than nothing" or suggest that providing infrastructure like these examples works to allow people to "gain experience" or as a "gateway drug" to more cycling in the future. Unfortunately, none of this is true. There is no "tipping point". i.e. no level of cycle-usage from which only growth is possible and no level of cycle-usage from which an increase in funding for cycling in inevitable. What's more, none of this is new. There already exist dozens of existing examples of older inadequately designed infrastructure which wasn't quite good enough when first built and which remains not good enough decades later. We don't need to keep repeating the same experiment and achieving the same result. We have known for decades that isolated islands of not quite good enough infrastructure do not work as this was the most important result from Dutch research in the 1970s. Islands cannot create the comprehensive good conditions which are required for true mass cycling and they cannot demonstrate the potential for such a comprehensive grid. All that is achieved by repeating these errors is that time passes without real progress being made. That is why the UK and other countries are more than forty years behind the Netherlands. When you're working towards a high cycling modal share, it's important to make cycling as convenient, as pleasant and as safe as possible. All these things must go together. To encourage everyone to cycle, facilities must enable all types of cycling. While planners in the UK spend time trying to make cyclists slow down, the Dutch CROW guidelines emphasize the need to speed cyclists up. The Dutch work to remove those things which could slow cyclists down or lead to discomfort when cycling as these can put people off cycling. In the Netherlands, having to stop frequently when cycling, having to cycle slowly, having to ride single file, not having ridght of way and not having enough easy turnings all count as nuisances. These nuisances are recognized as working against cycling and must be reduced. In the Netherlands, cyclists are seen correctly as already a slow means of transport. Even the fastest cyclist does not reach speeds which are easily reached in a car. A requirement for "low speed at conflict points" is met by slowing down motorised vehicles not by slowing cyclists. It is recognized that forcing cyclists through narrow gaps, pushing them into conflict with each other or with other modes and limiting efficiency of junctions all have negative effects on cycling. Cycling needs to be made faster so that it competes with motor vehicles. Having to slow down, even rarely, is a "nuisance" and nuisances are designed out of the cycling network. Consider what this paragraph implies: "Cyclists have no standard traits. On the contrary, the Dutch cycling population is characterised by a broad composition in terms of age, gender, physical capacities and reasons for cycling. In certain conditions, the fast commuter cyclist is indicative for the design (in terms of design speed, for example). 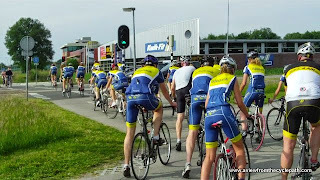 More often than not, however, the group of older cyclists with limited physical capacity will determine the limits (in terms of gradients and crossing times, for example). In still other cases, the design will be geared to young, inexperienced, sometimes careless cyclists (in terms of eye level, red light discipline and the complexity of intersections, for example)." they all got across in one green light. So the Dutch view is that there is no standard cyclist, and everyone should not and cannot be reduced to a common level. Rather, the infrastructure for cycling needs to support all cyclists, whatever their ability or degree of strength. Designs may be varied in some locations, for example to make conditions extra safe for children near schools, but that doesn't mean abandoning the other cyclists at that location. The only way to achieve true mass cycling is to accommodate the entire population's needs. Far from seeing cyclists as "speed freaks" who need to be slowed down, the design speed for corners on Dutch urban cycle facilities is set as a minimum of 20 km/h for minor cycle-paths rising to 30 km/h for through routes because "people must be able to cycle at high speed". Yes, the intention is to enable people to safely cycle as fast as they wish to. That is how to make cycling speeds competitive with other modes and therefore make cycling attractive. The Dutch recognise that speeds of "35 to 40 km/h" are not at all uncommon downhill and this is why there should be "plenty of free deceleration space at the bottom of the incline, with no intersections, sharp bends or other obstacles in the way". The requirements for speed in the relatively flat Netherlands are way above the speeds that Leeds and Bradford see as problematic due to "speed freaks" going downhill and clearly above the speeds that Cambridge planners think will be achieved along Huntingdon Road. And of course its not just those two. Look at Bedford, Northern Ireland, Southend or London and you find similar constraints, low standards and treatment of cyclists as a problem. Low aspirations lead to a lower cycling modal share. The full potential of where you live can only be achieved with the very best infrastructure. Copying from and starting to emulate the best examples from the leading nation is the most efficient way to make a real start. Until you have caught up, there's no reason to try to re-invent the wheel. 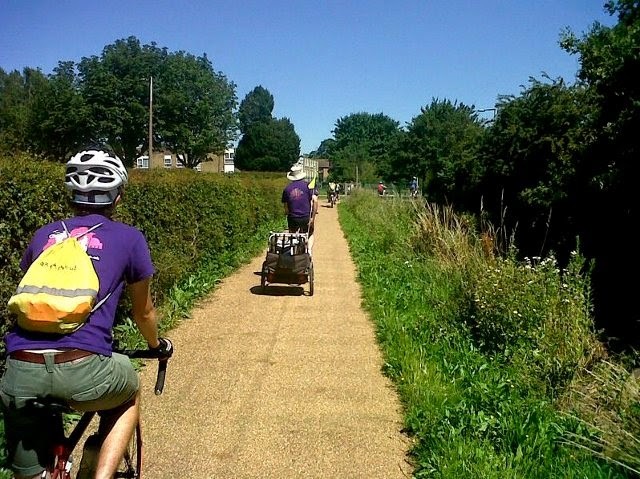 We run regular cycling infrastructure study tours to demonstrate to politicians, planners and campaigners from all over the world what the best quality cycling infrastructure in the world looks like. The frequency with which the same mistakes are repeated elsewhere demonstrates that there is a widespread lack of knowledge of how to progress. We can help with this, but only if people seek our advice. My daughter went to a music festival over the weekend. 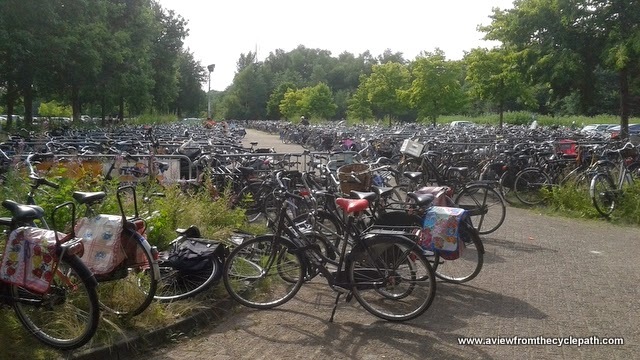 She sent me this photo of the cycle-parking: bicycles as far as the eye can see. This is what true mass cycling looks like, but photos like this sometimes mislead. This volume of bikes is not here as the result only of providing cycle-parking. The most important part is the comprehensive grid of extremely high quality infrastructure which goes everywhere, which accommodates all types of cyclists whether or not they're in a hurry and makes everyone safe. That's what enables huge cycle parking facilities across the Netherlands to fill up. It's startling how many countries have cycling design guidelines which include ideas which are deliberately designed to slow cyclists down. Southend-on-Sea. Missed opportunities to create a better environment for cycling and walking. our home to Groningen airport. A few months ago we entered a competition at a "business contact day" and were lucky enough to win a pair of tickets for the very convenient flybe service direct from Groningen airport to London Southend Airport. Groningen airport is only 18 km from our home in Assen, easy cycling distance, so we travelled by bike to the airport on Friday to get the flight. On arrival at Southend-on-Sea, the most straightforward way to travel to the town was by rail. The railway station is conveniently located opposite the airport terminal. It cost £2.90 per person to cover a distance of just over 2 miles (3 km). "Cycle Improvements" ? Where ? Directly outside the railway station we came to one of the most confusing road layouts in the town. The huge Victoria Avenue / Queensway junction, recently renamed "Victoria Gateway" is the only place in Southend where an obvious claim had been made that it was improved specifically for cyclists. The junction has a sign which lists organisations involved in providing funds and even has a couple of words of Dutch on it. But there is little if anything here to benefit cyclists. A short stretch of shared use pavement, a very slow toucan crossing and a couple of ASLs would seem to be all that cyclists are provided with here, though the road is enormous and very busy. It being the parlance of present day planners, I can't help but imagine that this new design was sold with a promise that it would "create a place". But there is no "place" here which anyone wants to be in. What we actually have is a huge area of asphalt dedicated to motor vehicles alongside another huge anonymous concrete area which is dedicated to absolutely nothing at all. No-one stops here unless they have to. Everyone who you see here is desperate to get away as soon as they can. This is not a destination, it's merely an inconvenience on the way to a destination. What this also is is a terrible missed opportunity. Rather than a genuine advance in infrastructure to encourage cycling, Southend built this. However, there's nothing here which comes even close to best practice with regard to cycling. It will take an awful lot more than this to truly turn Southend into a "Bike Friendly City". This is claimed to be a "Shared Space", but there is clearly nothing remotely "shared" about it. The safety of this area has been questioned, and there are complaints that it is being "ruined" by skateboarders who use it because facilities specifically for them are distant. This conflict of uses could have been avoided by building a decent skate park nearby for a small fraction of the cost of this development. Rather, this is an example of wide pavement syndrome. Next day update: I predicted yesterday that someone would try to make out that this was "a place" and I was right. Further investigation reveals that none other than Sustrans now refer to this as a "pocket place". They've recently produced a newsletter about it, referring to the lighting installation which is to come. A local blogger, Ria, already wrote about an interactive light show on the open concrete area and discusses the area further. She had "lazily dismissed it a few times during the day as it was slightly off-path from between Southend Victoria and the high street. And my small curiosity didn’t beg at me to take a few seconds detour from the fast-paced crowd to even ask" and said that "The Victoria Gateway doesn’t generate a lot of footfall as is. And why should it? Even without the skaters there, people have no reason for going beyond the short walk between Southend Victoria and the high street." Ria is absolutely right ! This is not the sort of place that anyone would want to stop in, no matter how much money is spent on a lighting show. It's a desert in the middle of a large road junction. It's not a nice place to be and won't become a destination for anyone. Also interesting to read Ria's views on the skateboarders: "Many even go so far as to complain, if not about the unruly appearance of Southend’s skaters loitering in the area, then with concerns of safety for the young skateboarders attempting tricks and falling off their skateboards so close to the traffic. You may complain about the skateboarding there, but you have to admit that they tend to keep to themselves and they seem to be the only ones utilising that vast area at all." The idea that anywhere like this can become a vital "place" that people want to go to just because a huge amount of money has been spent on a new road surface is patently absurd. One of the other things that struck us as we walked from the railway station to our bed and breakfast was how long it took merely to cross the road in Southend. Southend has a lot of traffic lights and pedestrians are required to wait behind them for a very long time before they can cross the road. The majority of the crossings have excessive waiting times for pedestrians. We often had to wait more than a minute to cross the road. By the sea-front we found just one example which was actually designed to prioritize walking, just like their equivalents in the Netherlands. Why aren't they all like this ? Multi-stage crossings with railing cages in the middle were a common sight in Southend. These make progress slow for pedestrians, effectively increasing the length of journeys. They make driving more attractive than cycling. When crossing times are so long, this greatly increases journey times by foot. It is the equivalent of making walking journeys several times longer, and for that reason long delays also make walking several times less attractive. Where it's not convenient for drivers that pedestrians should be able to cross, Southend has erected barriers to prevent pedestrians from making efficient and direct journeys. We wanted to cross the road at this point but it was made impossible by railings so we had to keep walking and make a less direct journey. These are an artifact of 1960s road design to encourage driving. They are hostile to walking. Assen had railings just like this in the 1960s, but got rid of them decades ago, along with the through traffic which made them "necessary". More railings at the corner of what seemed to be an excessively large junction. Not only are railings like this inconvenient for pedestrians, they also are dangerous for cyclists. who be squashed against them by larger vehicles. Another road with no safe crossing. There are three lanes to cross here with an unusual layout. Islands which could have provided a small refuge and a little assistance to pedestrians have instead been given an uncomfortable surface to discourage pedestrians from standing on them. Pedestrianized street in Southend. This is a thriving area. People like to be where the motor vehicles are not. Southend pedestrianized its main shopping street in the 1960s. That was relatively advanced thinking. The same street remains pedestrianized. Sadly, unlike many equivalent streets in the Netherlands, bicycles are excluded. This results in cyclists having to make longer journeys around the shopping street on roads which are busy with cars. Not only does that make journeys longer but it also makes them more stressful and more dangerous and this makes cycling less attractive. This cyclist dismounted to cross the pedestrianized street. Previously Victoria Circus, this huge open space really ought to allow cycling as it provides an alternative route west-east to avoid the busy A13 junction shown above. All alternatives to riding across here are detours on busy roads. Very small children rode scooters through the pedestrianized area, but even on such a safe machine and in a supposedly safe environment, parents feel that helmets are warranted. At this point, the pedestrianized street is crossed by a road. Cars are given priority and pedestrians have to wait quite a long time to get a green light. Just as in other parts of the city, most people cross the road against a red light because waiting times are excessive. Note no cycling sign in the pedestrianized street. In Assen we have pedestrian priority signs instead or forms of street which exclude motor traffic but allow cycling. Unfortunately, even this pedestrianized street is not entirely car free. Pedestrians are required to wait at a pelican crossing even when walking along their pedestrianized street in order to cross a fairly busy road taking cars across the pedestrianized area. That this doesn't really work successfully is illustrated by the existence of signs which warn that it's a "Pedestrian Accident Area". These signs at least show the true cause of danger, which is motor vehicles and not cyclists. Just outside the pedestrianized street we're back to normal British road design, hostile to cyclists and pedestrians. The one modern innovation on this street is a charging point for electric vehicles, the fuel for which is subsidized by the local council (and local tax-payers). Cyclists have been forgotten about and many take to the pavement for the sake of their own safety. The sea front area is a "shared space". This changed in 2011, with the area being renamed "City Beach". A small sign requests that pedestrians, cyclists and drivers should "Share space". Regular readers will know that I'm skeptical of the benefits of shared space. I've seen many shared spaces now, both in the Netherlands and in the UK and I've yet to see an example which is better than other possible arrangements. Claims for safety are unfounded, the needs of vulnerable road users are neglected. Nothing that I saw in Southend changed my view. This area is adjacent to the quicker pedestrian crossing shown above. It has a 20 mph speed limit controlled by speed cameras and I think it's fair to say that the speed limit has actually made it relatively pleasant given the enormous flows of traffic here. However, the traffic is still a problem. If this is truly supposed to be a place for people travelling by foot or by bicycle then why is it still dominated by a continuous and heavy flow of through motor traffic 24 hours a day ? The opportunity to fix the problem at source wasn't taken. As a result, there is little "sharing" going on. Drivers have a road to drive on, pedestrians have pavements. While the bravest cyclists ride on the road, others stick to the pavement. A woman with children on the back of a tricycle provided another example of where most people feel safe to cycle . This cyclist clearly found it more pleasant to make her journey on the pedestrian area than on the road "shared" with cars. Redeveloping this short stretch of road cost 7.5 million pounds. There are claims that despite its high price, this was a "bodge job". According to a local paper, the fancy paving was supported by blocks of wood instead of a proper foundation and the new surface is already sinking. This has "affected the drainage and led to flooding". Next day update: As is commonly the case with "Shared Space", this one needed to have pedestrian crossings retrofitted to it so that people could stop the traffic and cross the road. There has been at least one injury already on the pavement. You may also enjoy a local cyclist's video of "sharing" this road with drivers who overtake even at the speed limit. There is a Sustrans National Cycle Network route through Southend. This goes along the sea-front, using the pavement rather than the road through the "shared space" area. As is so often the case with these routes, it's not designed to allow efficient and safe cycling. I only saw roughly a mile length of the route because we were walking, not cycling. But even in this short distance there were obvious problems. Under the pier, cyclists go into a blind corner. Further to the west it consists of a path which is far too narrow for safe bidirectional use and positioned so close to car parking that it creates a "dooring" problem. There's plenty of space here for a cycle-path of sensible width for bidirectional use and to place that cycle-path further from the doors of legally parked cars. In this case, the passenger was actually standing on the other side of the car on the cycle-path as the cyclist passed. This isn't pleasant or safe for either party. There's no problem due to a lack of space. I estimate that nearly 30 metres in width is available to be re-arranged, currently occupied by wide pavements on both sides of the road, the cycle-path, two lanes of traffic, two lanes of parked cars and a wide verge in the centre of the road. There is simple no reason for this cycle-path to be so narrow or positioned where it is. It turns out that the other problem with the Sustrans NCN path is that is doesn't actually go anywhere. This cycle-route is approximately 6 miles long along the sea front. Try to turn towards the city centre and you would instead find yourself riding either on a shared use path alongside, or on the enormous "Queensway" dual-carriageway, leading to the advanced stop line at the huge junction in the last section. Due to the central streets excluding bicycles, you can't usefully reach many of the shops by bike. There is no sign at all in this town of the dense grid of high quality cycle-paths required for a high cycling modal share. None of Sustrans' suggested routes could have taken us so far as the airport on any quality of infrastructure. Shared-use path alongside Queensway. This is actually one of the better bits as its reasonably wide, but there are obstacles even in the short distance between giving way to this side road and negotiating the crossings near the upcoming roundabout. In that distance we have to avoid posts in the shared use path, steer clear of blind corners and make sure we don't ride too close to the wall. Next day update: The door zone route along the sea front is supposedly a "hybrid" path. This is a low quality design of cycle-path which exists in the UK only as the result of a misunderstanding in 2008 by Cambridge Cycling Campaign members. How on earth did Southend pick this up as a good example to try to copy ? If you're copying from the Netherlands, it's important to look for the best examples. Southend's smaller streets offer some utility for cycling and here there is some good news for cyclists resulting from low cost measures. On-road contra-flow cycle-lanes and other filtered permeability improve the convenience of cycling. Unfortunately, it's not comprehensive and design standards are not high. It's not enough to create the comprehensive and subjectively safe network required for everyone to cycle. By the sea-front, this contra-flow lane allows cyclists to descend one of the steepest hills in Southend in a narrow lane against the direction of motor traffic, picking up considerable speed as they do so. When those same cyclists get to the bottom of the hill at the new shared space area they have to enter this narrow chicane with hard kerbs and give way to cars. There's no useful straight on here, you must turn either left or right. A better junction could surely have been designed than this. Southend has narrow cycle-lanes on some of the minor roads but they're often in "the door zone" like this one. Faced with such poor cycling infrastructure, cyclists will often use the pavements instead although those are not ideal either. Pavement cycling problems are usually in reality poor cycling infrastructure problems. A contra-flow lane in a residential street. This is relatively usable because it creates a more direct route by bike. Poor implementation (kerbs, between car-parking areas so risk of reversing cars) but useful none-the-less. Cycles can go in a straight line here while cars cannot. This idea, but very much more of it and very much more evolved, makes up a good part of the Dutch cycling network. On-road cycle-lanes are rarely truly beneficial to cyclists. 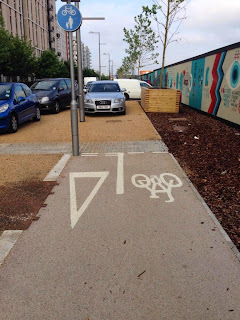 This cycle-lane creates an expectation that cyclists will dive to the kerb immediately after passing parked cars. At a junction, the kerb is the wrong place to be, even for a left turn. 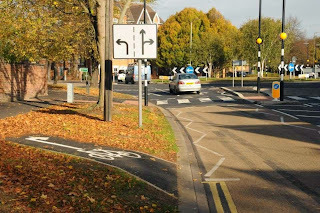 This cycle-lane and ASL are simply not of any real utility. The feeder lane is short and narrow and the space between the central island and the kerb is not side enough to be shared safely between a motor vehicle and a cyclist. The overall environment here is hostile to cyclists, this follows from a corner with railings featured above. Car parks in Southend were full and overflowing with cars. This is something we're not used to seeing. A successful transport policy which convinces people to walk or cycle instead of drive greatly decreases the need for car parking. This can especially be seen in Dutch cities like Assen where car parks don't fill up despite low cost parking. Southend has many car parks and every one of them that we saw seemed to be full during the day. When people have no real choice but to drive, they will do so almost regardless of the cost of parking. This enormous use of cars is part of what keeps the roads full of moving cars. A real alternative would take away the problems of trying to cope with such high car usage. It's clear that the people of Southend have little alternative but to drive, and so driving is the main way that they travel around the town. It's a small town so journey lengths will in many cases be relatively short, but the alternatives to driving are not attractive enough to encourage people out of their cars. Providing such a large number of car parking spaces is a huge cost for the town. All this driving also costs the people who live in the town. Good quality cycling infrastructure costs less to build than not to build, but for that to apply the quality level needs to be much higher than that of what I saw in Southend. On Sunday morning we walked back to the centre of Southend and took a bus to the airport. This was slightly less expensive than the train but took more time. If we'd set off by foot instead of waiting then we would have reached our destination sooner. The bus journey took us the two miles back to the airport along roads which had almost no cycling infrastructure at all. This being Sunday morning there were a few recreational cyclists in evidence, riding on the roads, and we also saw one child riding on the pavement. There were a few very narrow on-road cycle-lanes and a few shared-use paths but nothing which added up to a useful network, nothing which would have made cycling to airport into a safe and pleasant experience. On arrival in Groningen we found my daughter's boyfriend had ridden from Assen to meet us so we cycled 18 km back home together on cycle-paths which stretch the entire distance. My daughter and her boyfriend. They rode hand in hand most of the way home. This photo was taken right outside Groningen airport (that's their wire fence). This is a unidirectional cycle-path, its the same on the other side of the road, and as it happens this is the worst quality stretch in the 18 km between the airport and our home in Assen. I'm not cherry-picking Dutch examples to make the comparison seem more convincing, this is genuinely as bad as it gets on this journey. The reason why an 18 km journey to the airport is easier to make by bike here than a 3 km journey is to make in Southend is that we have this infrastructure. It's that simple. 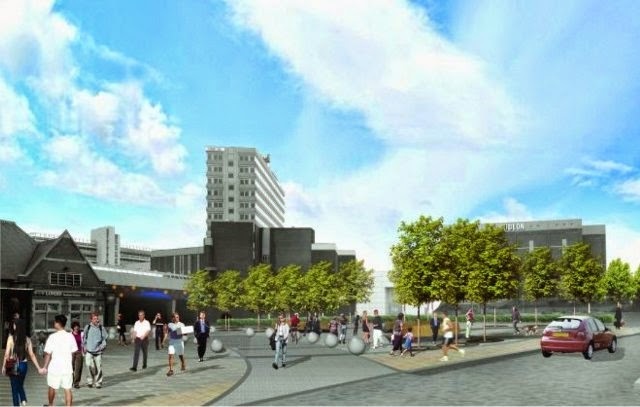 So what is holding Southend back ? It's not the weather, it's not that journeys are long and it's not that it's a particularly hilly place either. here. I hope she recovers. There's plenty of evidence of suppressed demand for cycling in Southend, as there is elsewhere across the UK and other countries. You see it in such things as children riding scooters in the pedestrianized zone, people who go for short rides up and down the sea-front, the occasional teenager riding a BMX bike through the town, the mum who waits for a gap to cross the road, the occasional roadie who cycles in front of the bus until he's overtaken a bit sharply. You even see it in the frustrated faces of people looking for somewhere to put their cars in overloaded car-parks as well as when they reach into their pockets to pay for parking. People don't need to be persuaded to cycle. They just need the infrastructure to change so that they are not continuously persuaded not to. While cycling means indirect journeys in the close company of motorized vehicles and is neither convenient nor safe, you can't just tell people to cycle and expect them to take it up as if they'd never thought of the idea themselves. What's needed is infrastructural change which enables people to ride bikes without feeling like they are in mortal danger as they do so. Cycling doesn't have a training problem. It doesn't have a PR or marketing problem. What is being faced in the UK is an infrastructure problem. Southend, like many towns, actually demonstrates very well how infrastructure influences behaviour. Changes made in the 1960s resulted in the town which exists today and resulted in the traffic patterns which were planned for. Historical photos of Dutch towns in the 1960s look just like photos from the UK at the same time. However Dutch towns no longer look like that. They changed again in order to make cycling attractive once again. That is what resulted in the surge in cycling and Britain could do exactly the same thing. Unfortunately British towns, including Southend, are not doing it. They are trying to change while also trying to stay the same, repeating the same errors as have been made elsewhere. So what are they doing ? Southend-on-Sea borough council's website doesn't have very much to say about cycling, but what it does say emphasizes such things as "encouraging cycling across the wider community targeting groups and individuals [...] cycle training, working with employers to persuade employees to cycle to work, recycling bicycles, cycle routes and cycling events". The council's Cycle Southend website ("We've got it all!") talks about "helping you get on your bike [...] lessons on learn to ride, getting back in the saddle and fun themed guided rides." Their "Ideas In Motion" site has a few "ideas" for cycling and the Local Sustainable Transport Fund application says they will look at "Reducing traffic congestion, Working with public transport companies to improve information on times and tickets, Encouraging people to walk more, cycle or use public transport rather than using cars, Build on the success of the Cycle Southend, Encourage more use of electric vehicles." It also says that five million pounds is available to businesses to help them with this. Meanwhile, over on the "Bike Friendly Cities" website, Sustrans' claims to be helping Southend with "a cross border user group analysis, enabling local key stakeholder groups and an awareness campaign." The motherlode of sustainability jargon is to be found on another council LSTF page which contains all these words: "The focus of the 2015/16 revenue programme will be to build seamlessly on the current LSTF programme, improving sustainable transport connectivity, thus enabling people to travel conveniently in and between the growth areas of the JAAP, Southend Central Area and east Southend development sites without reliance on the car. The programme comprises complimentary work streams delivered with established partners: Marketing, raising awareness, and information provision: through the development of a PTP smartphone application, targeted marketing for walking cycling and PT, and supporting a further social enterprise led Travel Hub, providing on-site Personalised Travel Planning (PTP), information and advice; Access to work and education: supporting employers and SMEs to embed workplace travel plans, providing PTP at workplaces, higher education establishments and Job Centres, and delivering “Learning in Motion”, a joint Sustrans/SBC programme embedding cycling in the curriculum with primary/secondary schools; Improving sustainable transport links: through wayfinding, and encouraging use of new walking and cycling routes". Wow. An awful lot of organisations are involved in maintaining an awful lot of websites and producing an awful lot of paperwork. Unfortunately, it's all nonsense. No-one reads this stuff and decides to ride a bike on the back of it. The value of these words does not add up to the value of one metre of cycle-path (and one-metre on its own is not very useful at all). It's very obvious why towns and cities like Southend are not making progress in cycling. They're doing a lot of talking and even spending quite a lot of money but they're simply not making the investment that they need to make in the things that they need to invest in. The path to world class results is simple: follow world class best practice. We'd be delighted to show you how. Is cycling too expensive ? From what I've been able to make out from a variety of sources, redevelopment of the two "Shared Space" areas, neither of which offer much in the way of benefits to cyclists, together cost around fifteen million pounds. These two schemes alone consumed enough money to have cycling at Dutch levels (€30 per person per year) for about four years in Southend. Spent well, this money could have achieved a great deal. Unfortunately, Southend cyclists got nothing more than a few ASLs, a very slow toucan crossing and a short length of shared use path. To put that into some perspective, here in Assen, a very good quality very safe traffic light road junction cost the cycling budget less than 1/400th of that figure and half a mile of very high quality cycle-path cost about 1/100th of what was spent in Southend. i.e. Southend could have built 80 km of Assen quality cycle-path as well as all the junctions to join them up. In any case, the only reason why cycling has a cost greater than its benefit in the UK is that the money is spent on a combination of building low quality (though sometimes very expensive) infrastructure and production of copious quantities of paperwork, neither of which achieve an increase in cycling. Good quality infrastructure which actually does result in more cycling pays for itself several times over. Mistakes already made are difficult to reverse, but it's time to just get on with it. Don't wait another reminded meforty years to make a start. Copy from best practice to achieve world class results. Rachel Aldred reminded me that Southend received extra funding as a "Cycling Town". More examples of the results of this can be found here. 14 year old buy trapped under bus in shared space. People often wonder if their geography makes their town uniquely unfit for cycling. This is not the case for Southend. Southend-on-Sea has a slightly smaller population than Groningen in the Netherlands. It's a very compact town, approximately half the size of either Assen or Groningen with a population density twice that of Groningen and roughly five times that of Assen. Such a small place should be ideal for cycling. Journeys within the town can only be over short distances. I haven't been able to find climate date for Southend, but given that other places nearby have mild weather we can expect this to be less extreme than these Dutch cities. Southend does have some hills, particularly near the sea front, but they're not extreme. Roads mostly take routes along the hills and not directly up them. In any case, London Southend Airport, two miles inland is up the hill, but its only 17 m above sea level. Cycling and walking facilities aside, we really enjoyed our weekend in Southend-on-Sea. In particular I must point out that The Railway Hotel must be one of the best pubs in the UK (excellent music, excellent food, excellent beer) and that The Keralam Restaurant does wonderful Southern Indian food. Both these places were recommended to us by very friendly and helpful local people.